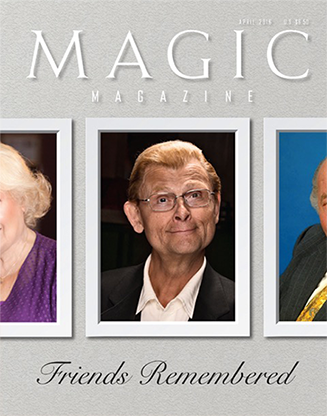 Tom Mullica's tragic death in February cut short a return to magic by a legendary comedian and sleight-of-hand artist. 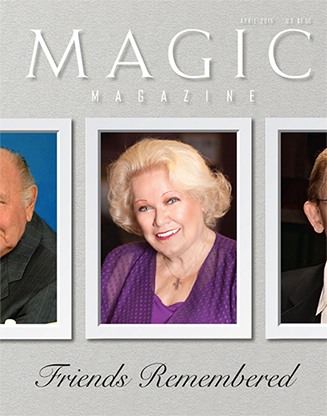 Known affectionately as Princess Irene, Irene Larsen was a major figure in the world of magic - the spirit behind The Magic Castle, and much more. "No practice required" only makes sense if you just want to know how a trick works. For anything more, you should know how to practice. Will Fern's journey in magic has been simple: all he wanted was to make a living performing magic, anywhere he could. And he has succeeded. All fourteen of the products reviewed in the April issue, plus 591 reviews from previous issues, are all now available at the fully searchable "Marketplace" section of M360. The memorized deck holds a special place in my repertoire. Ever since I first got in touch with it sometime in the mid '90s, a performance of card magic for me usually involves two decks - one shuffled and one memorized. My first book covered some of my work with the shuffled deck; the time has now come to have a look at the other one. Physics tells us that lifting an object increases its potential energy. Similarly, I like to imagine that every time we arrange our cards in memorized order, we are really charging the pack. In Order to Amaze, then, suggests a number of ways to turn this energy into amazement. The following trick, Catch Me If You Can, is a two-deck, two-phase sandwich routine that contrasts sleight of hand with hands-off test conditions. It also uses a somewhat offbeat method that makes me smile every time I do it. 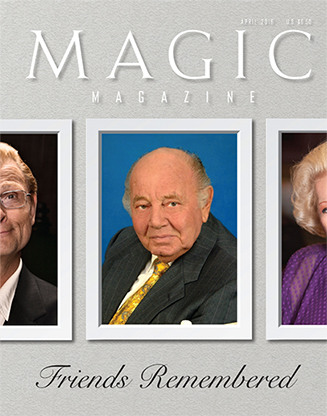 When Patrick Page died in 2010, he left behind a legacy in magic, including a series of interviews conducted in the UK in 1977. This archive contains over forty hours of largely unreleased interviews with Page's friends, may of whom are magic legends. Patrick's daughter Janette Page says, "My dad was a great interviewer because of his knowledge of his subjects. They all talk about their careers, the tricks they did, and why. Plus he prods them a bit on personal stuff, too. It is a very large snapshot of a wonderful and fertile period of magic history, and has so many fascinating insights of the greats then, to be heard again now." What follows are brief excerpts from recordings with Jay Marshall, Cy Enfield, and Maurice Fogel. Bank Job is designed to allow you to easily write a custom presentation tailored for your clients. It's the kind of personal touch that gets you remembered and leads to repeat bookings. The effect has one of my favorite magical moments. Right up to the end, the audience thinks they have the trick figured out. Then you sweep the rug from under their feet - a demonstration of the "not perfect enough" theory in action. Here is my presentation for magicians, in which I poke fun at six of our magical peers. But you can easily customize the effect for any interest group by simply changing a few names. Guest contributor Art Vanderlay has come up with a delightful new twist on standard prediction effects: it's a routine in which you predict the future backwards! More specifically, it's an intriguing and highly entertaining item in which you apparently receive a phone call from yourself in the future, giving you all the information you need to make a successful "prediction." It sounds weird - and it is - but it takes your audience on a fascinating excursion into temporal paradox. What's more, it's easy to do, and the one thing you need to make it work is free! Bent on Deception: I'm a Loner, Dottie. A Rebel. I think my "Mike Bent: Illusionist" phase was a common experience for magicians of my generation. There was so much cool magic going on, and I wanted to be part of it. I think it's the same reason why everyone in a more recent generation wanted to become "street magicians." Fortunately, I figured out early on that I wasn't cut out to be the next David Copperfield. That harsh realization was softened by a resurgence of comedy magic, fueled by people like Larry Wilson, Harry Anderson, and Penn & Teller. I felt that in them I had found my "tribe," and I haven't looked back. But every now and then, I do miss one thing from my box-pushing days: assistants. Developing a subtle approach to a Multiple Cards to Pocket, Interchange, Ambidextrous combination sounds improbable. However, by applying the loose tenets of the Monk's Way, I cobbled together the following working model. In this effect, the four Kings and Deuces are shown and signed. The Kings are each placed in four different pockets. One at a time, the Deuces change to Kings. The Deuces are shown in each pocket and replaced. Next, the Kings in your hands change to Deuces, and the Kings are shown in the four pockets. The Kings are then placed on top of the four Deuces. The packet is pressed and the Deuces are shown to have vanished and are removed from the four pockets. Microsoft recently released a study intended to make their customers a little more comprehensible to their marketers. In 2000, the average human attention span, they claimed, was twelve seconds. In 2013, the average human attention span was eight seconds. Eight seconds may seem like a lifetime if you are riding a bull, but performers have to think about sixty minutes of riding a bull - so to speak. I recently went to the Magi-Fest convention in Columbus, Ohio, and enjoyed myself. It was a good convention, solidly run and well organized. One thing that particularly impressed me was the level of attention given to encouraging and supporting young magicians. There was an event specifically focused on advice for younger magicians, and a large blank section of wall where experienced magicians were encouraged to write down advice they had for younger ones. Being so busy with other things at the convention, I didn't have time to think about what I wanted to write. Now that I've had more time to chew it over, this is what I would say to young people interested in magic.